The Horror Section: Slow & Subtle Wins The Race. As I mentioned before, the back-end of the Fantasia line-up seemed a little underwhelming at first glance, but there were two wild cards. The first was a Belgian film called Left Bank, which sadly we missed (too much drinky and not enough clock watching) and an Irish offering called The Eclipse. Failed writer and single father Michael Farr (Ciarán Hinds) meets Lena (Iben Hjejle) while driving her around an annual lit convention in a small Irish village. Lena writes ghost stories and Michael hopes she can shed some light on why he keeps having visions of his father – who happens to still be alive! The Eclipse I must say was a nice surprise. It's funny because it could almost not even be considered a genre film. This is a movie about character interaction and the supernatural element is almost secondary. Director Guillermo del Toro once said of his 2001 film The Devil's Backbone, “it's not a ghost story, but more of a story with a ghost in it”. The same is true with The Eclipse. The protagonist has an 'encounter' early on in the film – which is brilliantly executed I might add – and then that is it for a good half hour. 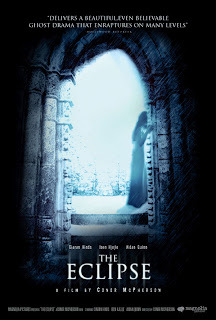 I have heard The Eclipse compared to the works of Kiyoshi Kurosawa (Pulse, Retribution) and I can see that. However, The Eclipse is not hurt by its pace, as I find a lot of Kurosawa's works are. At a cool eighty-eight minutes, I found Conor McPherson's film to be far more engaging. The film also recalls the works of Michael Haneke, as not much happens, but sudden spikes out of nowhere keep you constantly compelled. The Eclipse is a relationship drama at its core. It is one thing to have well written characters, but the actors who bring them to life is what takes it to the next level. Hinds gives a wonderfully reserved performance as Michael, a man trying to find inspiration and move on after the loss of his wife. He is perfectly complimented by Iben Hjejle and the two of them sparkle with chemistry. 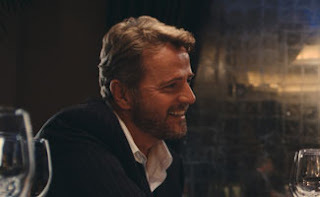 Thrown into the mix is Aidan Quinn who steals every scene he's in as the sleazy alcoholic author Nicholas Holden. I'm actually surprised by how much I liked it. I didn't know where it was going to go and it didn't wear its intentions on its sleeve. The Eclipse is sometimes funny, sometimes depressing, but ultimately hopeful. I'm really glad I saw this film here because I probably wouldn't have otherwise. It is a sincere and realistic character piece of a rare kind these days. It is not easily definable and I fear this tiny Irish production will be quickly swept under the rug. Well, I'm here to say that if you like character driven slow-burns, then The Eclipse is for you.